Our skin is exposed daily to a large number of chemicals in household products, cosmetics, in the environment and in the workplace. Many of these chemicals can cause irritant or allergic contact dermatitis. Allergic contact dermatitis is an inflammatory skin disease that is mediated by our immune system. 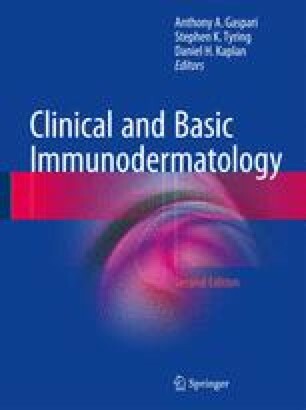 In this chapter we summarize current methods for the diagnosis of contact dermatitis and treatment strategies. In addition we review our current understanding of the cellular and molecular pathomechanisms and its implications for the development of novel diagnostic and treatment strategies and of animal-free testing strategies for contact allergen identification. What is the outcome of the sensitization to contact allergens? What is a hallmark of contact allergens? Which standard test is used for the diagnosis of ACD? How do the metal ions nickel, cobalt and palladium activate the human innate immune system? ACD is a T cell-mediated skin disease. Which T cell subsets are the main effector cells of ACD? Novak N, Baurecht H, Schafer T, Rodriguez E, Wagenpfeil S, Klopp N, Heinrich J, Behrendt H, Ring J, Wichmann E, Illig T, Weidinger S. Loss-of-function mutations in the filaggrin gene and allergic contact sensitization to nickel. J Invest Dermatol. 2008;128(6):1430–5. 5701190[pii]. doi: 10.1038/sj.jid.5701190. Akdis M, Palomares O, van de Veen W, van Splunter M and Akdis CA. TH17 and TH22 cells: a confusion of antimicrobial response with tissue inflammation versus protection. J Allergy Clin Immunol. 2012;129(6):1438–49; quiz1450–1431. doi: 10.1016/j.jaci.2012.05.003. Quaranta M, Knapp B, Garzorz N, Mattii M, Pullabhatla V, Pennino D, Andres C, Traidl-Hoffmann C, Cavani A, Theis FJ, Ring J, Schmidt-Weber CB, Eyerich S and Eyerich K. Intraindividual genome expression analysis reveals a specific molecular signature of psoriasis and eczema. Sci Transl Med. 2014;6(244):244ra290. doi: 10.1126/scitranslmed.3008946.